Looks like Vodafone is jumping on the Android bandwagon. 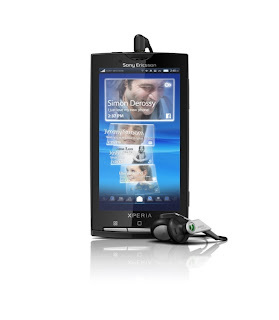 Vodafone UK has recently announced that they will be offering the Sony Ericsson Xperia X10 in April. The Sony Ericsson Xperia X10 is Sony Ericsson's first Android powered mobile phone and features 1GHz Snapdragon processor, 8.1 megapixel camera, WiFi, Bluetooth, UX platform, and Android 1.5. The latter isn't something to jump about considering that the Google Nexus One (a phone which Vodafone also claimed to be releasing "in the next few weeks") has Android 2.1 but the 8.1 megapixel camera and UX platform may entice Android fans. There's no pricing yet and April is 2 months away so by the time that the Mobile World Congress comes along, Sony Ericsson may decide to bump it to the latest version of Android. If they managed to bump this to Android 2.1 then I'd happily buy it over the Nexus One. Well this Sony Ericsson Xperia X1 features an interactive panel interface that lets you customize the smartphone to your wants and needs.The Windows Mobile device also has an attractive design and a full QWERTY keyboard.Its a well-designed and fully stocked smartphone that offers great customization through the interactive panel interface.